On Sunday, November 19, the world will turn its attention to the lowly—yet incredibly important—toilet bowl. World Toilet Day was created in 2013 by the United Nations General Assembly to inspire action to tackle the global sanitation crisis. Today, 4.5 billion people live without a household toilet that safely disposes of their waste. One of the organizations leading the way toward solutions is the Bill and Melinda Gates Foundation, which launched the Reinvent the Toilet Challenge in 2011. Grants were awarded to sixteen researchers around the world who are using innovative approaches—based on fundamental engineering processes—for the safe and sustainable management of human waste. 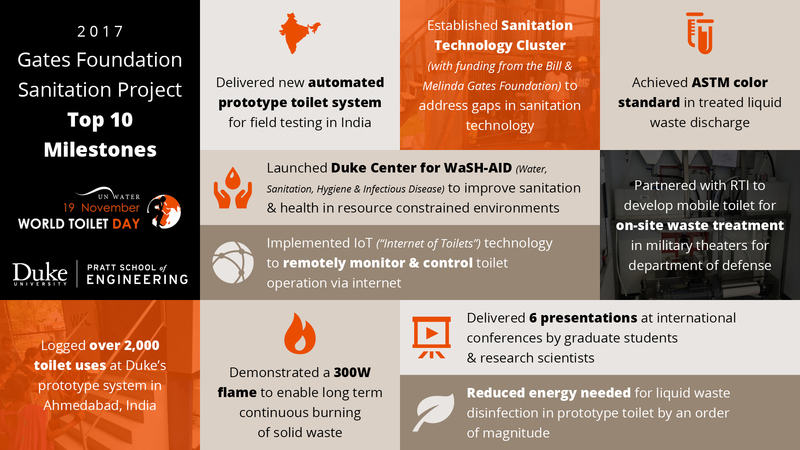 Duke University researchers are leading two of these important projects, and have been tasked with establishing a new Sanitation Technology Cluster, which will go beyond toilet designs to fill various gaps in sanitation solutions. Below, learn more about how Marc Deshusses, professor of civil and environmental engineering; Jeff Glass, professor of electrical and computer engineering; and Brian Stoner, research professor of electrical and computer engineering, are working to bring sanitation to areas in need.